It's men's market week in New York, a time when buyers, bloggers and everyone in between make the rounds between the trade show circuit and designer showrooms to discover what's in store for Spring/Summer 2012. Valet traveled to ENK, Project and Capsule and found these three relatively young labels that you'll want to keep on your radar. There were 169 menswear brands showing at the Capsule trade show. Rundown: Made by one of America's oldest shoe manufacturers—operating since the 1750s—these boots are washed and then tumbled in industrial machines, resulting in a supple leather and soft footbed. No breaking in required. Price range: Boat shoes from $200. Boots around $300. 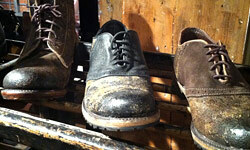 Standouts: Hardy Tanker Boots in black, brown and tan that look like they've seen a few tours of duty. 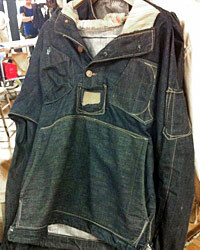 Rundown: Proudly made in Connecticut, this denim manufacturer represents its roots with coated brass buttons emblazoned with the state seal and a leather patch inspired by the state's geography adorn handsome Cone Mills denim. And they happily offer repairs and custom orders. Price range: Varies depending on your order. Standouts: A selvedge pullover hoodie constructed as a single piece without armholes, allowing more freedom of movement and currently being tested out by Hartford bike messengers. Rundown: Founded by twin Brooklynites Shimon and Ariel Ovadia, the brothers specialize in smart fabrications, expert tailoring, and accoutrements that are grown up without being stuffy—shantung ties anyone? Price range: Footwear from $52, ties from $85, shirting from $125, pants from $175 and suiting from $695. Standouts: We liked the painted oxford shirts and unstructured peak lapel canvas sport coats. 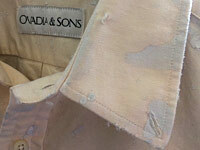 A white cashmere double-breasted dinner jacket (with mother-of-pearl buttons) also caught our eye.